Swallow Your Baby’s Placenta One Pill at a Time! The notion of eating your baby’s placenta has always been tied to strange, gag-inducing, sensationalized stories. You probably caught wind of the celebrity rumor that Tom Cruise claimed he would eat his newborn’s placenta, and when the concept of digging into a placenta meal is mentioned in social circles, the typical response is a wince, a gag, and arms waving ‘no!’ But placentophagy, (eating the placenta) is being increasingly marketed to the mainstream as a practice for new mothers to help them stave off postpartum depression and recover more quickly after giving birth. 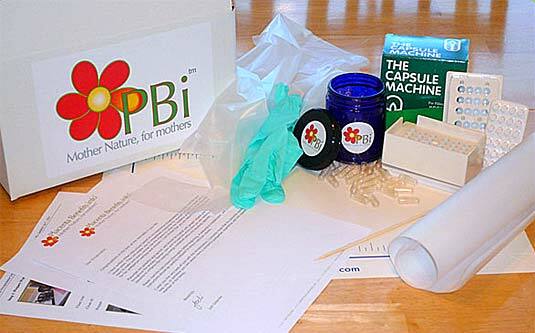 DIY Placenta Encapsulation kits are now available for use in the privacy of one’s home. Placenta Benefits.info is one website that sells this kit, alongside a slew of convincing reasons to start swallowing your baby’s placenta one pill at a time. With a list of promising results including: balancing your hormones, enhancing your milk supply, and increasing your energy, the Placenta Benefit.info website makes their placenta encapsulation services seem like every new mother’s magic pill. Most moms-to-be fear all of the above, asking themselves, ‘Will I get depressed, produce enough milk, be able to handle the demands of a newborn?’ And Placenta Benefit.info seems to offer the perfect poppable solution via ingesting one’s own placenta. But there is no scientific data that eating the placenta actually wards off postpartum depression in women. There’s plenty to be found and debated on the topic, but it all certainly seems like a hard pill to swallow, given that there is no evidence that women will reap the rewards of ingesting their baby’s placenta. This is interesting. I've never heard of it. The best thing I've seen done with the placenta is placenta art. You place the fresh placenta on paper, press, and get a really awesome print to frame. It sounds odd, but looks amazing. Personally I like tree planting best - but you could do the print first. I had a specialist do the encapsulation for me. The pills are easy to take and I never had a single day of baby blues! I personally know women that have had postpartum depression with their first child or children and then they took placenta pills they were fine, no PPD! Postpartum depression is a major issue for too many women... why wouldn't you want to try something natural before resorting to pharmaceutical drugs? It was a risk I wasn't willing to take. This article seems to show a clear distaste at the end due to "lack of scientific data". I would only humbly suggest that the data we have on animals in addition to the information about what is actually IN the placenta equals plenty of scientific evidence unless you're unwilling to compare yourself to mammals which share 99.8% of your DNA. Please don't mistake yourself being grossed out for a lack of evidence - please just present the information and give your readers the opportunity to make choices for themselves without the added weight of your opinion. Perhaps not as clear-cut a form of cannibalism as, say, eating your young (which BTW is also common in the wild kingdom). But if eating a human organ isn't cannibalism to you, ipso facto you're not human. I had postpartum deperssion with my first birth and it was terrible! With my second birth, I chose to look into the most natural, humanistic way to deliver the perfect balance of hormones to my body that it needed after the biggest hormonal shift it woudl ever go through. The difference in the two births was amazing!!! Just amazing! For the first two weeks postpartum, I ingested thumbnail sized peices of raw placenta blended in a protein shake, twice or three times a day, or I'd use yogurt and berries. I had a small tear from giving birth that was healed in 5 days. I produced large amounts of breastmilk, and had tons of energy!! After the second week, I started taking the capsules, and had the same results, but with the raw in the shakes is the way to go! I did save half of the capsules to help with menopause, which I've heard works really well. I pray that every mother can avoid PPD and have a beautiful, memorable first few months with their new babies! Swallow Your Baby's Placenta One Pill at a Time! The notion of eating your baby's placenta has always been tied to strange, gag-inducing, sensationalized stories. You probably caught wind of the celebrity rumor that Tom Cruise claimed he would eat his newborn's placenta, and when the concept of digging into a placenta meal is mentioned in social circles, the typical response is a wince, a gag, and arms waving 'no!' But placentophagy, (eating the placenta) is being increasingly marketed to the mainstream as a practice for new mothers to help them stave off postpartum depression and recover more quickly after giving birth. DIY Placenta Encapsulation kits are now available for use in the privacy of one's home. Placenta Benefits.info is one website that sells this kit, alongside a slew of convincing reasons to start swallowing your baby's placenta one pill at a time.